New iPad. iPad 3. We’re not sure what to call it. In what seems to be an annual progression of slight improvements, the iPad 3 has hit the market. The dimensions are very similar to prior iterations of the iPad so it is highly likely that if you have purchased mounts with a custom iPad cradle they will fit fine. The iPad 3 is a little thinner than the first generation and .03 inches thicker than the 2nd generation. If you have an older 1st generation iPad mount with custom cradle, just add some thick tape strips to the back of the cradle to use as padding to accommodate the space within the depth of the cradle. By the way, this small dimensional change is part of why we always recommend a universal cradle that is spring loaded versus the custom cradles. If you ever get tired of IOS or Apple in general, you can use the mount for another brand or smaller form factor of an iPad. We have already received inquiries into the mounts so figured it was time for a post. More so than past iPad generations, your tablet is becoming an even larger part of your everyday life. In the car, the iPad 3 can be used for navigation, communication, entertainment and productivity. Prior to purchasing your new mount, think about what you plan to do with it. After answering that question, think about where you have room. For entertaining the backseat passengers, the answer is easy. Use a headrest mount. We have cover headrest mounts in depth elsewhere on this site and you can read about that topic here. The executive summary in case you don’t want to click on the link is that there are two different types of headrest mounts and it all depends upon how many people / kids are in the back seat. More than one suggests that a centered headrest mount will work best. Just one and you can go with a traditional headrest mount. Want to use your iPad 3 as a big giant GPS? There are a lot of GPS applications available on IOS. We absolutely adore Waze and you can read about that here. Regardless of what application you use for navigation, mounting your iPad for this purpose is a little more difficult than a GPS. A GPS is less than half the size of the iPad 3 and the added size of the tablet means more of your windshield landscape will be blocked by the tablet. 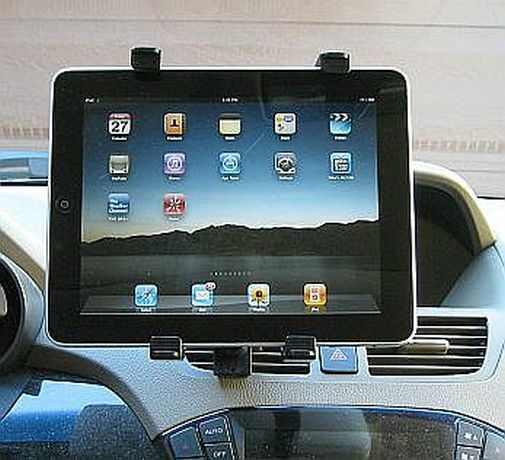 There are a lot of suction mounts for your windshield that will hold your iPad 3 securely however we suggest mounting your iPad 3 in a different place. We recommend a good vent or cup holder mount. The vent is a perfect place as it will keep your iPad 3 at an excellent height for viewing while you drive. Buy a vent mount that will grip your vent slats very securely and make sure your vent is well made so that the weight of the iPad 3 will not break the slats. A cup holder is another excellent location. Buy a cup holder mount that has an extended gooseneck to lift it over the stick shift and places it closer to a convenient line of site. Communication is a touchy subject but a lot of people do it just don’t do it while you are driving your car. Using a vent, cup holder or floor mount places the iPad at an convenient location for when you stop the car and wish to message or talk using a VOIP application. Putting it on your seat just never worked for me, and I’m sure it won’t work well for you either. Adding a good mount will place the iPad 3 where it’s convenient to use when you are ready to use it.